While the exact tasks at hand vary, our projects focus on improving the forests and parks in our local cities. Healthy forests are vital to our community because they filter rain water, purify the air, provide living spaces for wildlife, and give people a place to connect with the outdoors. Sturdy, closed-toed shoes (work boots, hiking boots, rubber boots, or tennis shoes). Bring your friends, coworkers, service club, religious group, or family to volunteer with EarthCorps! EarthCorps can accommodate volunteers of all ages and groups of 3-100. To sign up your group see below. How should I sign up a group of volunteers? Look at our Volunteer Calendar to see what events are coming up. Click on an event to get more information about the specific event and sign up. On the Sign Up Form, select “Leader of a Group” and write your group name and the number of spots you would like to reserve for your group. Contact the Volunteer Team if you have any questions, or if you are having trouble finding an event that fits your group. Let the Volunteer Team know if your group will be larger or smaller than your initial estimated headcount. What if my group is larger or smaller than I initially thought it would be? Tell the Volunteer Team if your group is going to be larger or smaller as soon as you know of the change. We plan the work for the day based on the number of volunteers we expect to participate. It’s hard on the volunteer leaders when there aren’t enough people to complete the work. If I signed up a group, does each group member need to sign up individually? No! In order to avoid duplicate counts, please do NOT ask members of your group to sign up on our website. Can I bring a group of kids/youth? Yes! Kids, scout troops, sports teams, or other groups of youth are welcomed to volunteer. Depending on age, we will need one adult to every 4-10 youth. The group leaders should contact the Volunteer Team directly to sign up and complete a group waiver. Can I bring my school class to an event? EarthCorps loves working with schools and classes! Please visit our School Partnerships page to find out more information about how to get EarthCorps connected to your school. Volunteers of all ages are welcome! The work is typically geared towards adults and kids 10 and up, but younger kids are welcome to participate. Parents of younger kids should expect to supervise their children. Youth under the age of 14 must be accompanied by a parent, guardian, or responsible adult. All volunteers between the ages of 14 and 17 who are not with a parent or guardian must bring a completed and signed Youth Waiver the day of the event. Does there have to be an adult with every kid? All youth under 14 years old must be accompanied by a parent, guardian or responsible adult. Youth between the ages of 14 and 17 who are not with a parent or guardian must bring a completed and signed Youth Waiver the day of the event. Where can I get a Youth Waiver? Right Here. Youth between the ages of 14 and 17 who are not with a parent or guardian must bring a completed and signed Youth Waiver the day of the event. Turn in the youth waiver to the event leader when you sign in at the event. I signed a youth waiver last time I volunteered. Do I need to do it again? Yes. Youth must bring a new completed and signed youth waiver to each event. The waiver contains emergency contact information that need to be present at each event. Is it okay if my child and I leave the event early? Yes. Exposing kids of all ages to caring for the environment is important, but four hours is a long time for little ones. You are welcome to leave early, but make sure you show up at the beginning of the event so you do not miss important safety information. In many cases, volunteering with EarthCorps counts for service hours! Check with your school, class, or program to verify that volunteering with EarthCorps (a 501c3 nonprofit) will count. When you sign up for an event on our volunteer calendar, please indicate if you are volunteering for credit. This helps us know that our volunteer team needs to sign your forms and approve your hours. How do I get my Service Learning hours approved/verified? Make sure that you indicate that you are a service learning student when you sign up for the volunteer event. You are responsible for asking EarthCorps staff members to sign/approve your service learning hours. Ask the EarthCorps staff member to sign your papers at the event, or email the Volunteer Team. Don’t wait until the last minute! Allow 5 business days for the Volunteer team to get back to you. The Volunteer Team works Tuesday–Saturday. They are not in the office on Sunday and Monday. Expect to hear back from them later in the week. Do you accept volunteers for court-ordered community service? Yes, EarthCorps can verify court-ordered volunteer service hours. The only exception is that we cannot sign off on any hours completed within the City of Kirkland; all other locations are fine. Please contact the Volunteer Team at least a week ahead of time if you need verification submitted. 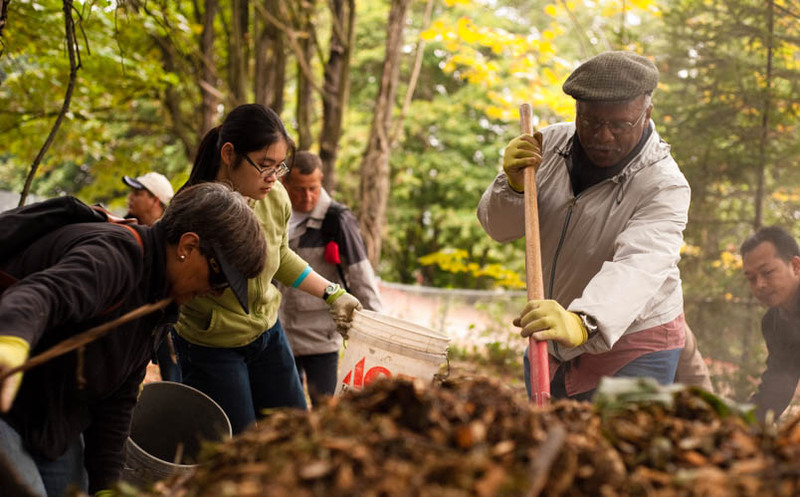 Does volunteering with EarthCorps count for the Washington State Workfare program (DSHS EBT)? Yes, EarthCorps is a registered Workfare organization. Forms can be sent to the Volunteer Team for verification. Please let us know at least a week ahead of time if you need verification submitted. Where in the park will the event take place? Each park has a different meeting location. Check the event on our Volunteer Calendar, or your confirmation email, for specifics about where to meet. In most cases, Google, Bing or other online maps will lead you to the wrong location, so please follow our directions. Typically there will be a big EarthCorps canopy and tables at the registration spot. Look for orange EarthCorps signs to direct you to the exact location where we are meeting. Will the volunteer event still happen if it's raining? Rain or shine, we will be out there! Unless there is lightning, high winds, or extreme weather, the volunteer event will still happen. We will have hot coffee and tea waiting for you, but make sure that you bring your raincoat and warm layers. Can I bring my dog to the volunteer event? No, please leave your furry friends at home.